Newport, RI. 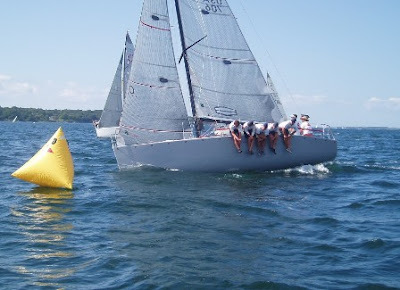 After seven tight races in Rhode Island Sound and Narragansett Bay, Deneen Demourkas’ Groovederci showed superb speed and consistency in capturing the crown of M 30 North American Champion for 2008. The team from Santa Barbara, CA posted a score line of 1,1,2,2 on the first day and after all racing was postponed on day 2, they held a three point lead over Bodo & Nick von der Wense’s Turbo Duck heading into the final day of racing. John Podmajersy’s Illusion was just one point behind Turbo Duck as the sailors rigged their boats on Sunday morning in little to no breeze yet again.